Internet Protocol Version 6 (IPv6) is a numerical label. It helps in identifying a network interface of a computer or any other network node. It helps in enabling data communications over packet switched network. The hexadecimal number system used a radix (base) of 26. In order to represent the values in readable format, the system uses 0-9 symbols. They represent values from zero to nine and the A-F represents the values from ten to fifteen. 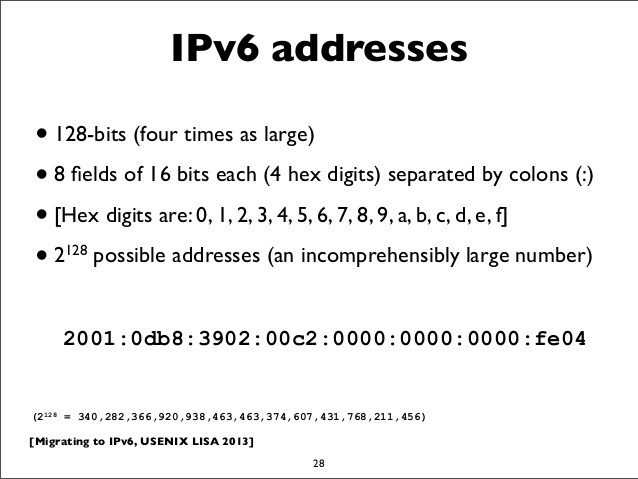 The IPv6 address consists of 128 bits that is divided into eight 16-bits blocks. Every block is then converted into 4-digit Hexadecimal numbers and separated by colon. The exponential growth in use of Internet from various devices such as computers, laptops, tablets, smart phones, wireless handheld devices, etc. has led to increase in need of additional blocks of IP addresses. The IPv4 supports around 4.3 billion unique IP addresses. Theoretically, IPv6 supports around 2128 address, that is, 340,282,366,920,938,463,463,374,607,431,768,211,456! 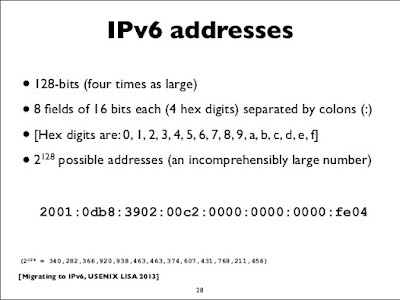 It is estimated that IPv4 address will be exhausted soon and will need IPv6. IPv6 and IPv4 have a similar structure and many transport layer protocols can support both. IPv6 helps answer the problem of increased address space. The 128-bits are definitely more useful than 32-bit IPv4 address. It gives a limitless number of unique IP addresses. Also, due to its size, it is less vulnerable to malicious activities like IP scanning. The main advantage of IPv6 is supporting Mobile IPv6 protocol. It allows mobile devices from switching between networks and receiving roaming notification, irrespective of the phone’s location. IPv6 address is now being used worldwide. Most of the latest operating systems now use IPv6 by default.